Digital photography uses cameras with the electronic photodetector to capture the images. Digital photographs are created by computer-based mechanical and photoelectric technique without using wet bath chemical process. Therefore, professional quality images can be delivered to consumers.Digital photography industry is experiencing tremendous changes as digital cameras and post production technology are affecting the operatives. The declining price of low-end digital cameras is the major growth driver of the digital photography market. Digital camera was introduced in 2003 since the then price of digital cameras is decreasing steadily. Growing trend of photography in photo sharing sites and networking sites are giving tremendous opportunity to upsurge the demand of digital photography. Demand for interchangeable-lens cameras with technological advancement like Wi-Fi enabled cameras are expected to gain traction in the digital photography market. However, good quality in smartphones cameras is becoming the challenge for digital photography market. Elongated product substitution cycle limiting the proceeds from novel patrons is hampering the market growth. To overcome this restraint customer has to pay the significant amount to buy the sophisticated camera. Traditional cameras require photo film of longer than 35 mm. Previously, when the shooting was in remote sites it was mandatory to carry a number of batteries with photographer and downloading that images in the computer may be laborious. Hence, professional photographers are switching to digital cameras which would lead the significant growth of the market over the forecast period. The purchasing power of consumer has affected adversely in U.S. due to the recession. Therefore, vendor introduced less expensive cameras in the market which lead to a large number of consumers with low purchasing power in developing countries compared to developed countries. Digital photography has different applications such as photography software, photo looks, photo processing and other applications. Other applications include business, recreation, science, security surveillance, art, data storage, professional photography, machine vision, photo books, automotive, and medical visualization etc. The niche markets such as sports, events, church directory photography are escalating the demand of digital photography across the globe. 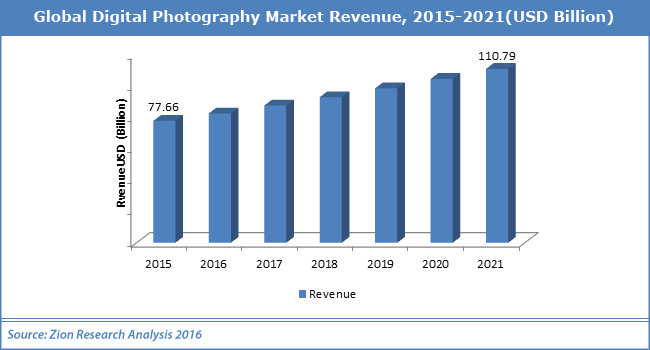 Vendors are continuously investing in R&D section to improve sales of digital photography products. They are introducing new cameras with attractive features like inbuilt Wi-Fi, smartphone, 3G SIM card slots, Bluetooth, direct interface with social networking sites and email, tablet-style interfaces, and Android operating systems to run all applications on digital cameras. Geographically, Asia Pacific gain majority share in the digital photography market due to improving spending capacity of consumers in India and China. Japanese corporation is spending heavily in R&D section to enhance novelties in digital cameras. Key players of this market are Nikon, Sony, Canon, Kodak, Panasonic, Samsung Electronics and the another prominent vendor are Casio Computer, Sigma, Fujifilm, Hewlett-Packard, Toshiba, Leica Camera, Ricoh, Seiko, Olympus, Epson, and others. Canon Inc. and Nikon are leading the digital photography market with the majority share.